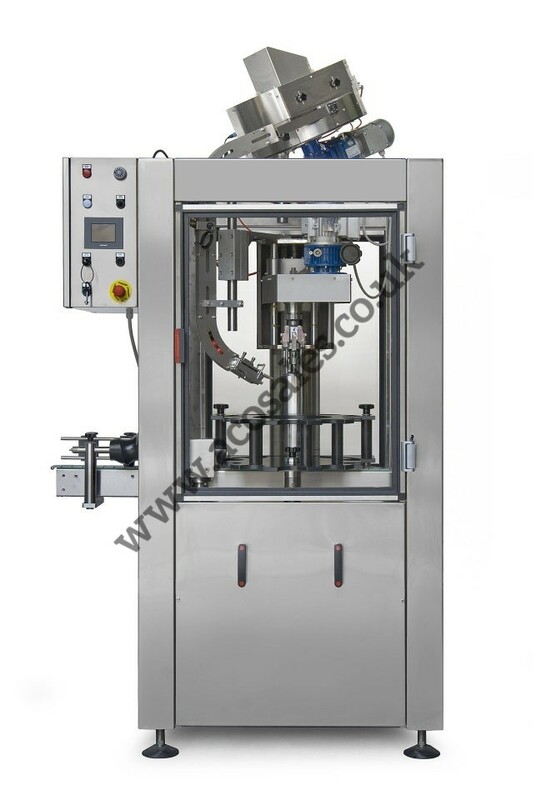 Automatic screw capping machine for closing pre-threaded and press-on caps on to bottles and jars. 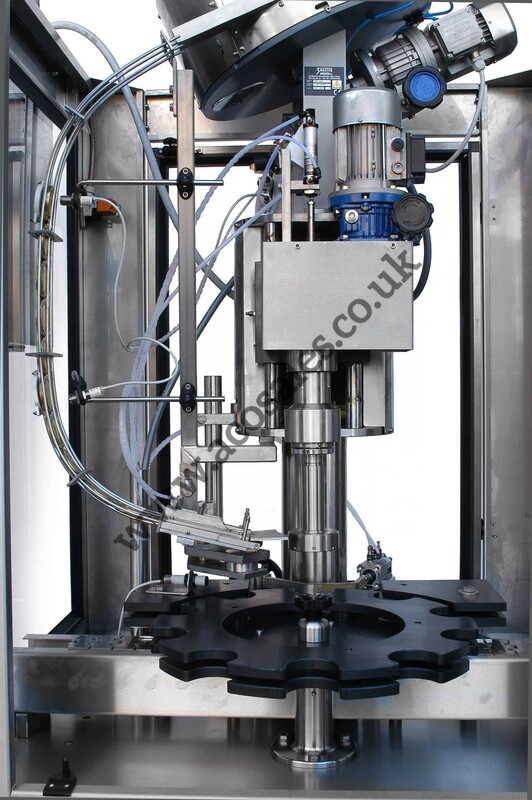 This machine is designed to run on a conveyor system after a filling machine to create an automatic bottling line. 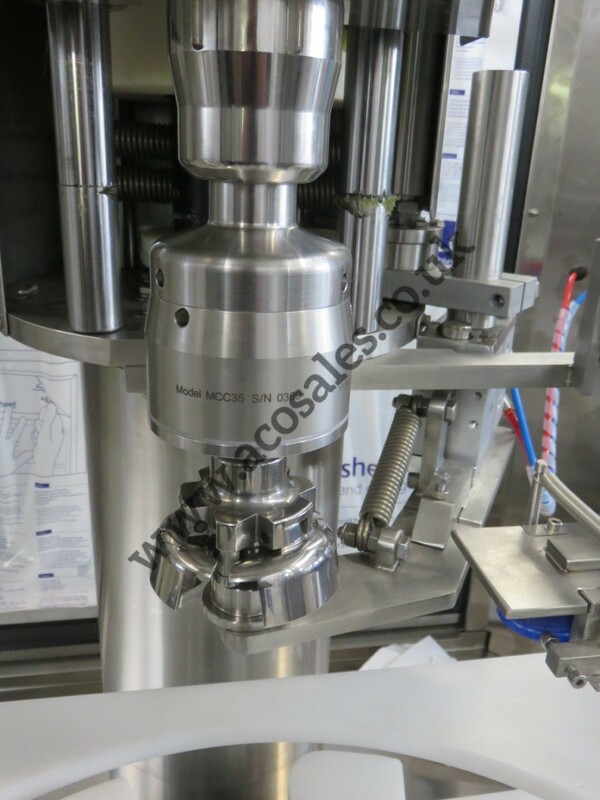 Stainless steel base mounted on adjustable floor levellers for easy alignment, Bearing frame and all surface components manufactured in AISI 304 stainless steel, Manual height adjustment via handle on column, Inverter controlled speed variation for machine, head speed and cap hopper, Automatic start photocell, Automatic stop photocell in case conveyor is full at exit, Caps in chute photocell, machine will not work if there are no caps present in the chute, Magnetic clutch capping head for screw caps, Pick & place cap system, 465mm diameter 10 pocket starwheel. Stainless steel electrical TOUCH SCREEN control panel with 24 volt auxiliary commands, Equipped with SIEMENS material on control panel, Automatic cap feeder, chute and applicating head, Electrical socket for optional elevator feed, Alarm warning light and acoustics. Safety guarding with interlock devices, CE mark, manual and operating handbook.